For over a decade, the Schwinn® I.C. Pro20™ has set the standard as the cycle studio workhorse. Now, 20 years after Schwinn built the first production bike for indoor cycling, we are proud to introduce the I.C. Pro20™. The newest addition to the Schwinn line combines the proven, authentic drive train of the I.C. Pro20™ with updated features. The Schwinn® Authentic Cycling™ Series is primarily based on one particular easy principle: we think that riding a bike indoors need to really feel as considerably like riding an outdoor bike as probable. We adore the way bikes feel, we love the way they audio, and we adore the fantastic workout they can supply. Cycling is the #2 most-common fitness activity in the entire world, so we know that a whole lot of men and women feel the same way! Schwinn® launched a phenomenon with the first production bike designed specifically for indoor cycling, and we’ve never looked back. Our newest bike, the AC Performance Plus™, is designed to enhance rider comfort with an infinitely adjustable seat and handlebars, a wider step-through and durable, covered stretch pads – all surrounded by a rust-free aluminum frame. The Schwinn® Authentic Cycling™ Series is primarily based on one particular easy principle: we think that riding a bike indoors need to really feel as considerably like riding an outdoor bike as probable. The Star Trac Studio 7 combines user-focused features, best-in-class biomechanics and a high degree of adjustability to deliver the optimal bike fit for riders of all shapes, sizes and abilities. 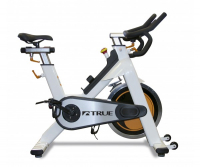 The Star Trac Studio 5 bike combines user-focused features, best-in-class biomechanics and a high degree of adjustability to deliver the optimal bike fit for riders of all shapes, sizes and abilities. The Studio 3 is compatible with our feature-rich cycling console that provides motivating user feedback and metrics.